Some pirates like using swords and daggers, some enjoy the sounds of cannons, but pirates like the one who owns the Pirate Warlord Battle Axe enjoys using medieval weapons. Just look at the thing! It strikes fear into your heart! 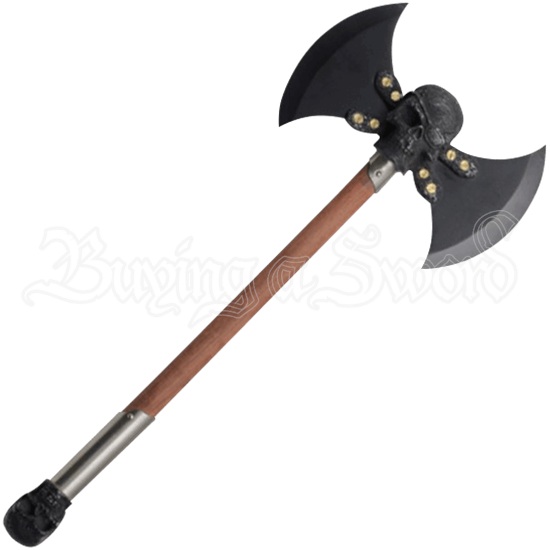 This brutal looking battle axe possesses a double bladed head, with each head being made from a blackened stainless-steel and secured to the centerpiece via golden colored screws. The centerpiece of this dark battle axe is shaped like a skull with an eye patch over its left eye. The brackets that come off the sides of it give the piece a skull and crossbones appearance. A stainless-steel collar attached this dark axe head to the wooden haft of the axe, which in turn is connected to another steel collar that is fixed to the darkened skull that makes up the pommel of the battle axe. This pirate themed decoration is perfect for the collection of any medieval weapons enthusiast or pirate lover. Bring a swashbuckling flair to your home with this macabre axe, or give it to a friend or loved one as a cool gift!